Salt Lake is surrounded by mountains of incredible natural beauty and filled with natural beauty nurtured by local residents. Visit Salt Lake is proud to be part of a destination that is actively engaged in the journey to make our community an environmentally-sustainable host for conventions, meetings, and visitors. In February 2002, Salt Lake was host city of the 2002 Olympic Winter Games, the "greenest" Olympic Games to date. The Salt Lake Olympic experience was extraordinary—100,000 people per day attended events and activities in Salt Lake over the course of 17 days. This required extensive recycling efforts, composting, mass transit, and many other ground-breaking green event practices that have now become mainstream in today&apos;s industry. Since the Olympic Games concluded, Salt Lake has worked to maintain a high level of environmental stewardship. By continuing our commitment to Reduce, Reuse, and Recycle, we are engaged in sustainable initiatives that preserve the well-being of our own backyard for the enjoyment of our visitors and locals alike. Visit Salt Lake&apos;s is commitment to sustainable meetings includes a set of Green Meeting Standards for meetings we sponsor or produce. Read on to find out more about the sustainable options available for your meeting and attendees. 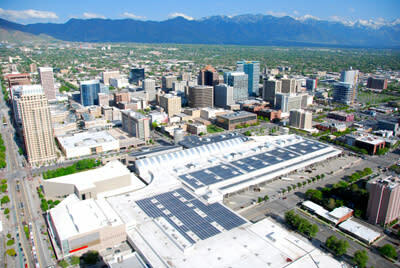 Salt Lake County installed a 1.65 megawatt rooftop solar array atop the Salt Palace Convention Center in the heart of downtown Salt Lake. The 2006 expansion of the SPCC was awarded the U.S. Green Building Council&apos;s Silver LEED Certification for being designed and constructed utilizing environmentally responsible methods and materials. Construction materials used for the 2006 expansion including steel, carpet and drywall were made with at least 10% recycled content. Adhesives, carpet and paint were all manufactured with low-emitting chemical materials. 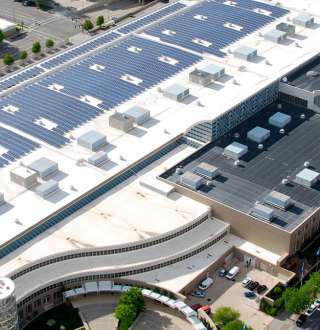 Other rooftop solar panels provide 20 kilowatt hours/day to power the underground parking lighting. Administrative offices use motion sensors for lighting systems. Restroom paper products have at least 20% PCC. Single Source Recycling: Ace Disposal company sorts all trash hauled from SPCC and recycles all available material. Improved centralized control systems and energy efficient operations of the HVAC system have provided a 35-40% energy savings in the 2006 building expansion, and a 25% energy savings in the original facility. Indoor air quality standard is monitored by increasing the air exchange rate in the facility. Water-conserving bathroom fixtures include hands free faucets, low flow toilets and waterless urinals. Drip irrigation systems and water-efficient landscaping minimizes the SPCC&apos;s water use. Bike racks are available in the parking structure to promote the use of alternative transportation. Preferred parking stalls are offered for all carpooling attendees/employees at the SPCC. Leave the car behind: the Salt Palace Convention Center is conveniently located within walking distance of more than 7,300 hotel rooms, 200+ restaurants, cafés and bars, and numerous arts, culture, and entertainment venues. Salt Lake&apos;s TRAX light rail Free Fare Zone connects the Salt Palace Convention Center with Convention District hotels and downtown activities/attractions, reducing the need for shuttle transportation. Salt Lake&apos;s TRAX light rail connects Salt Lake City International Airport to the Salt Lake Convention District. Salt Lake City International Airport is located just 8 minutes from the Salt Lake Convention District. Half the U.S. population is located within a 2.5 hour flight of Salt Lake. Salt Lake is building 70 miles of light rail and commuter rail along the Wasatch Front corridor, connecting 76% of the state&apos;s population with mass transit by 2015. Recycles all aluminum and cardboard products in addition to the single source recycling program at the SPCC, and incorporates recycling programs for grease and fry oil. Provides weekly food donations to The Road Home Homeless Shelter, the Salt Lake Mission and Utah Food Bank. 100% renewable Greenware products available. Uses 100% recycled paper napkins and compostable paper plates. Uses local food sources when possible, uses organic food sources upon request. Uses low level water dishwashing machines, reducing usage by 30%. Utilizes 100% biodegradable non-caustic citrus based all purpose cleaner (Citra-Sol).